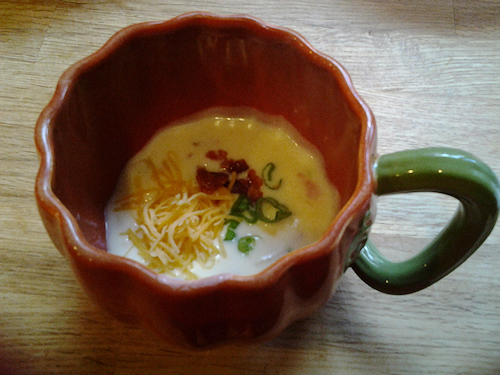 In case I haven’t told you yet, I love soups! 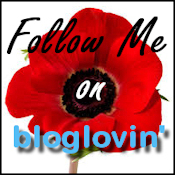 I am always looking for a new one and tweaking it the way I think it should be. Sometimes a little healthier sometimes a little more decadent. Here is my version of what this soup should be. 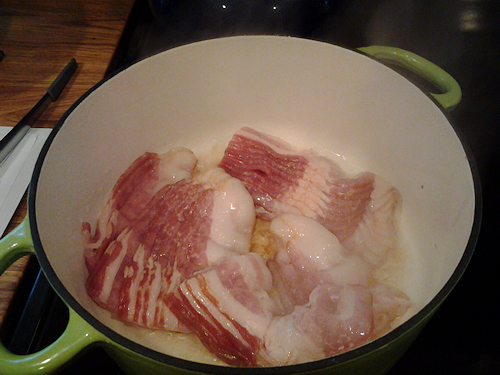 In a 6- to 8-quart stockpot, fry bacon until crisp. 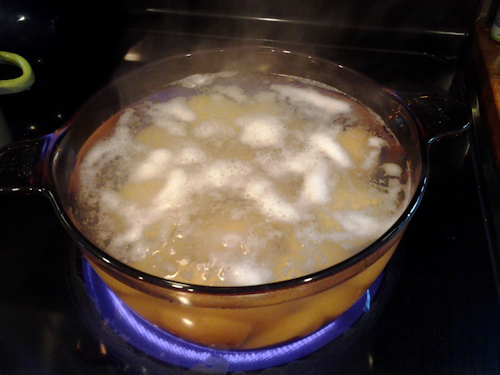 In a another 6- to 8-quart stockpot, boil some water with a hand’s throw of salt. When simmering add potatoes, I slice them into quarters. WHAT ABOUT THE SKINS YOU SAY!I truly believe this is a preference thing. Keep reading, we will get there 🙂 When bacon is crisp, remove bacon and drain on paper towels, reserving half for garnish. In bacon fat, cook onions and celery until the onions are translucent. Set aside. I like to think about just how I am going to do things differently and I get everything ready while I do that, so while the potatoes are boiling let’s get the toppings ready. Take the bacon we set aside and divide it in half. Cut roughly on a chopping board. 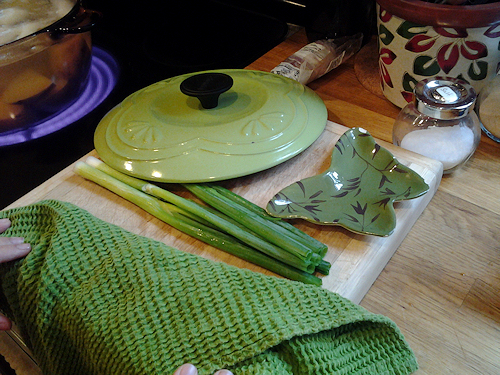 Take a good handful of green onions and slice into nice chopped pieces and set aside in a bowl. 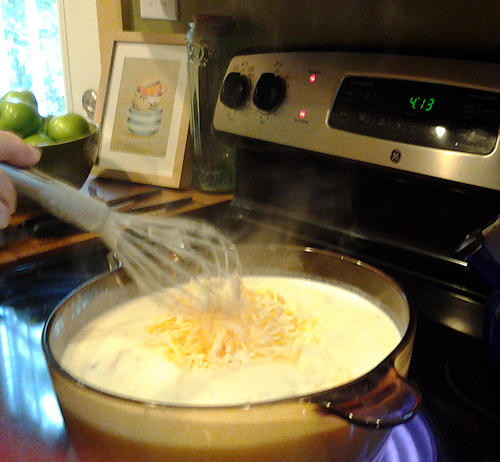 By this time our potatoes have cooked for about 10 mintues, which is perfect, so let’s heat the bacon pot back up and add the flour and butter then whisk until the rue is smooth. Set this aside while you drain the potatoes. Here is where you can decide to take some skins off. I usually take about half off and leave half one. The simplest way to do this is run cool water over them while draining and easily peel them off. 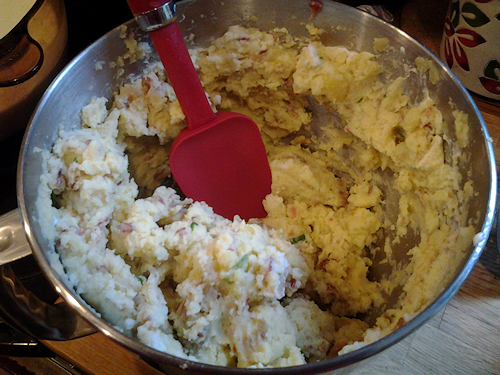 Now add those potatoes into your rue pot, stirring and kind of chopping them up roughly as you add them. I must confess that I add them to my kitchen aid and let it beat them to death like below. 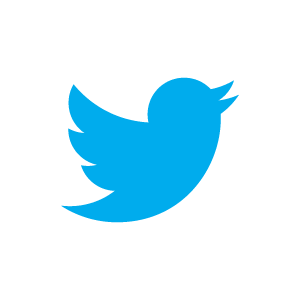 you may do this as well or you can do this by hand as i described above. 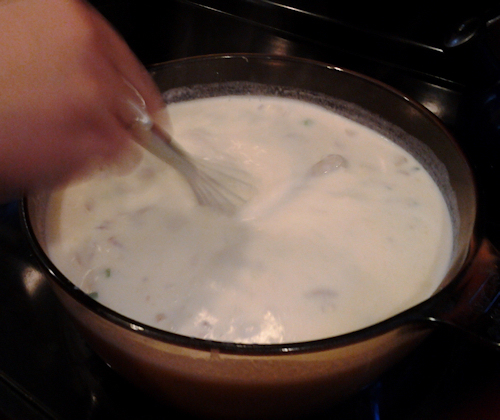 Once added into the pot, add the stock, cream and milk and get a nice creamy consistency. Now we can add the good stuff! 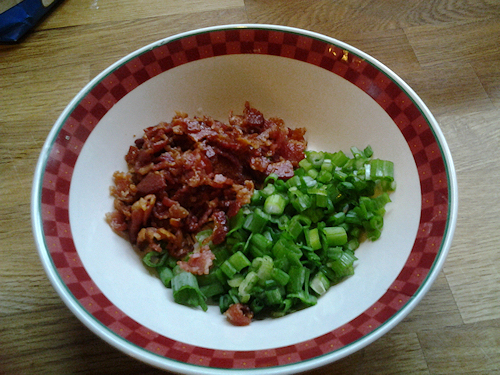 Add the cheese, bacon and a throw of some green onion. When I say a throw I mean a good size four finger pinch. Stir this all in together and you are ready to go!!! 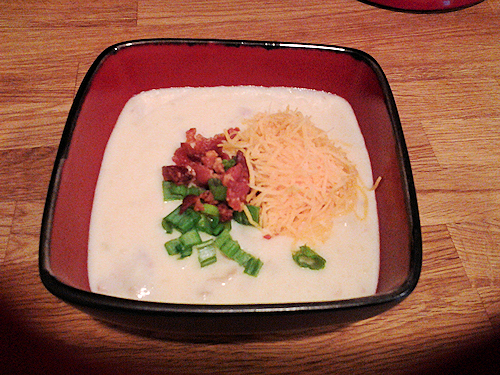 Top with a sprinkling of cheese, green onion and of course extra bacon! Dallop a spoonful of sour cream if you wish, but this is surely creamy enough! We’re getting into soup season as well and it’s wonderful all the different soups that can be made. This looks delicious.